Lucas and I want to thank you for bringing us together. 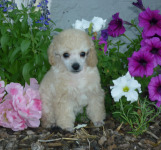 Lucas is a beautiful Rainbow Toy Poodle puppy. He is a very intelligent little fellow with a beautiful coat. He is eager to meet and greet everyone who enters his world – people and other canines alike. 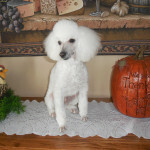 Last Labor Day weekend my husband, Dennis, and I flew to Utah to purchase these two girls from Rainbow Toy Poodles. We met with Connie and were so impressed with the quality of her dogs, and also the environment that they are being raised. We fell in love with Utah; such a beautiful place! I had been looking for a little poodle puppy online for sometime; but, none of the ones I went to see impressed me at all. I had just about given up on getting one until I came upon Connie’s website, Rainbow Poodles. 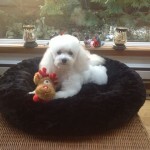 I went out the following day to meet Connie and see her poodles. What a wonderful experience I had from the moment I pulled up in front of her lovely home, surrounded by flowers and a beautiful manicured lawn. Connie so graciously welcomed me into her home, and the poodles that followed her were beautifully groomed and so friendly. I would have been happy with any one of them. I was looking to get a little red poodle puppy. Connie didn’t have any at that time; but, she was expecting a litter in 3 months. I left happy with the thought of getting a red puppy from that litter. 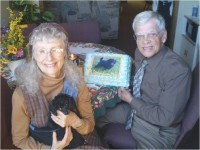 Our search for a perfect toy poodle led us to driving over 550 miles from Denver to the Salt Lake City area to accomplish that goal. 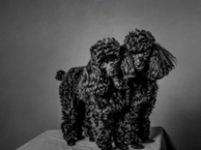 Yes, there were many breeders closer to home, but as far as we are concerned, none compared with what Connie Halcom of Rainbow Toy Poodles offered. It was not about “getting a good deal for the money”, but rather it was about the assurance of quality breeding lines, birthing procedures, and most importantly, those crucial eight weeks of interim care provided by the breeder. My husband and I make our living training and boarding dogs. During a span of two decades, we have worked with over 15,000 dogs and have at least 30 dogs playing freely in our doggy camp every day. Yet with all the classes, behavioral counseling, and daily observation, I still wasn’t prepared for the maze it can be to shop for a puppy on the Internet. To anyone looking for a quality-bred toy poodle, I highly recommend Rainbow Toy Poodles. The entire experience exceeded my expectations! When Doug and I contacted you about getting new puppies, we had visited multiple web sites, viewed countless pictures, and talked to many breeders from several states. Our biggest concern was buying healthy puppies. The pictures you emailed us were awesome. 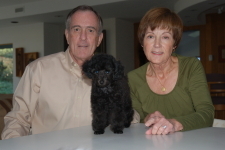 We so appreciated the number of questions you answered, the amount of time you spent sharing your vast knowledge about poodles and how to care for them. Our family is very grateful for your advice and help to get a family member of our dreams. When you offered us one of your wonderful puppies, you mentioned that the baby is very smart for his age, with lots of energy and love to play. How right you were about my Rizh!